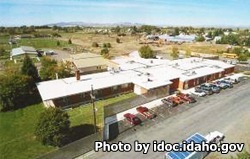 Saint Anthony Work Camp is located in Eastern Idaho. It can hold about 240 minimum/low-risk male offenders. Many of the inmates at this facility are provided vocational work opportunities, and even full time paid employment. Some of the field the inmates can work in are construction, and contracted work with various county government agencies, public services and not for profit organizations. By providing offenders with a routine work environment the work programs offered at St. Anthony help inmates to develop good work ethic while allowing them to acquire the skills needed to further their employment and manage a future financial resource. All visitors must fill out a visiting application and wait to be approved before they can visit. Visiting is on Saturdays and Sundays from 9am-2pm.